A fabulous trip to Disneyland Anaheim can be cost efficient without cutting corners. Where you stay should be near to where you play for maximum convenience and fast access to the park. One of the best hotels in the Disney area that fits the bill for comfort, accessibility and deep discounts on accommodation is the Anaheim Express Inn. Located on Orangewood Avenue in Anaheim, you can walk to the park in minutes on a calm and quiet street away from the busy traffic. Rooms at the Anaheim Express Inn are spacious, clean and complete with a private balcony or patio. Priced just right and a cut above the competition, this is one Disney local hotel that is easy on the wallet. The Anaheim Express Inn provides free parking, a tasty complimentary breakfast and has an on-site laundry room for do-it-yourself washing and drying. Although the Disney attractions are enough to keep you busy day and night, the city of Anaheim has a few more special places to see. Flightdeck Air Combat Center is heart-pounding action and adventure in a military fighter jet or Boeing jet simulator. To participate in Flightdeck, guests must be at least 11 years old and stand at least 4′ 11″ tall. This Top Gun training facility is located at 1650 S. Sinclair Street, closed on Mondays, and will accept reservations for flight rides. If you feel the need for speed, K1 Speed Anaheim on North Edward Court provides an all-weather indoor go-kart track. Perfect for all ages, the K1 Speed Anaheim cars can go up to 45 miles per hour along a serpentine track with plenty of bumper padding. The Anaheim Honda Center is host to some of the hottest attractions in town. Tickets for concerts, family events and sports from football to ice hockey are offered year round from the Honda Center box office on-site or online. The Honda Center is located at 2695 E. Katella Ave, just minutes from Disneyland and economical dining close by. 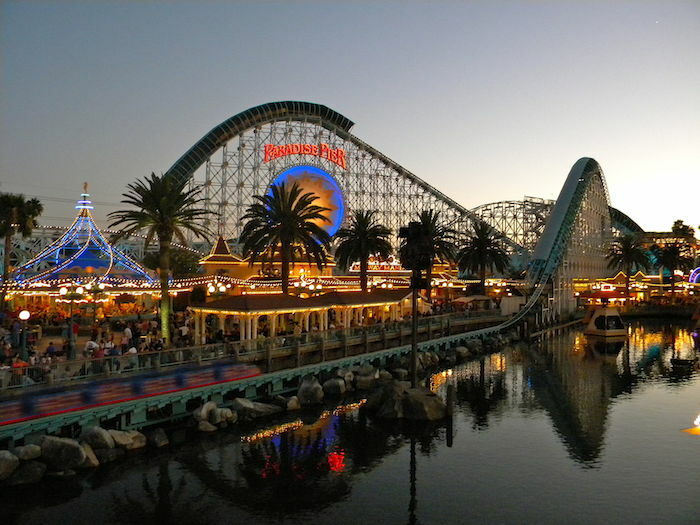 Vacations to So-Cal take you where you want to be for theme parks, beaches, dinner shows and after hours entertainment. The city of Anaheim is located along the 5 Freeway, providing easy northward access to downtown Los Angeles, Hollywood, and the Venice Beach area. The 5 Freeway South puts you on the fast track for Huntington and Newport beaches, the San Diego area on the 405 Freeway, and terminates at the Mexico/California border. The ideal visit to beautiful California is to be centrally located to your favorite attractions. Book a budget-friendly accommodation, enjoy the city’s eclectic dining options and Anaheim, Ca is one of the best bangs for your travel buck.